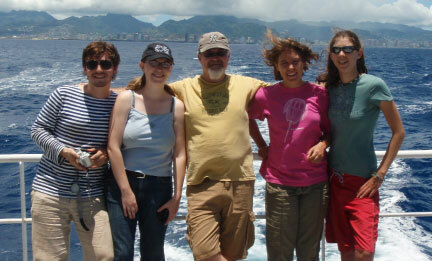 "Giving information away is really critical for my school, our discipline and oceanography in general. If you keep it for yourself then the benefit is so limited." His field work takes him to the nearby waters of Puget Sound as well as distant field sites off the coasts of New Zealand and South America. On campus Rick is extensively involved in his undergraduate and graduate students' research work and career development. Rick is Principal Investigator (PI) for COSEE Ocean Learning Communities (OLC), co-PIs Kathy Sider of the Seattle Aquarium, Dr. Phil Bell of the College of Education at UW, Dr. Fritz Stahr of the Ocean Inquiry Project, and Dr. Carrie Tzou of the UW-Bothell Education Program. COSEE OLC's mission to link ocean scientists, formal and informal educators, learning scientists, citizens, organizations and marine volunteers has resulted in several vibrant and productive collaborations. COSEE OLC has given Rick the opportunity to combine his research interests with his goal of "giving information away" through collaborations involving citizens, middle and high school students, undergraduate and graduate students, non-profits and governmental offices, thereby successfully bringing his research to a broader audience. Photographs and images for Ricks's pages provided by COSEE OLC, Rick Keil, and the SEW-G production team. Clicking on some slideshow images will open closeups.